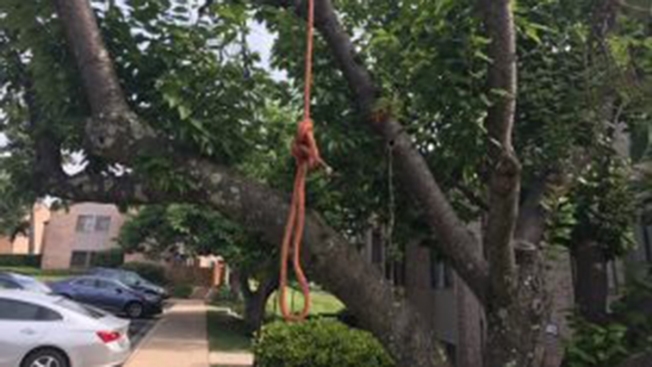 A noose was found hanging from a tree Wednesday morning in a condominium community in Montgomery County, Maryland. Montgomery County Police said the synthetic rope noose was found in a tree in a common area near the the Heron's Cove Condominium parking lot about 8 a.m. Officers responded shortly before 9:10 a.m. to community, which is located in the 18900 block of Mills Choice Road of Montgomery Village. Residents had no indication that the noose was directed toward a specific person and did not know about any related suspicious activity in the area, police said. An officer removed the noose. Anyone with information about the incident is asked to call Montgomery County Police at 301-279-8000.